Bali!!!! It is truly a beautiful place and I was excited about taking this trip. I stayed in Ubud where it was quiet, peaceful, and infinite greenery. I lived in the moment and checked my phone twice a day, once in the morning and again at night before going to bed. I didn’t want any ‘outside noises’ to interfere. 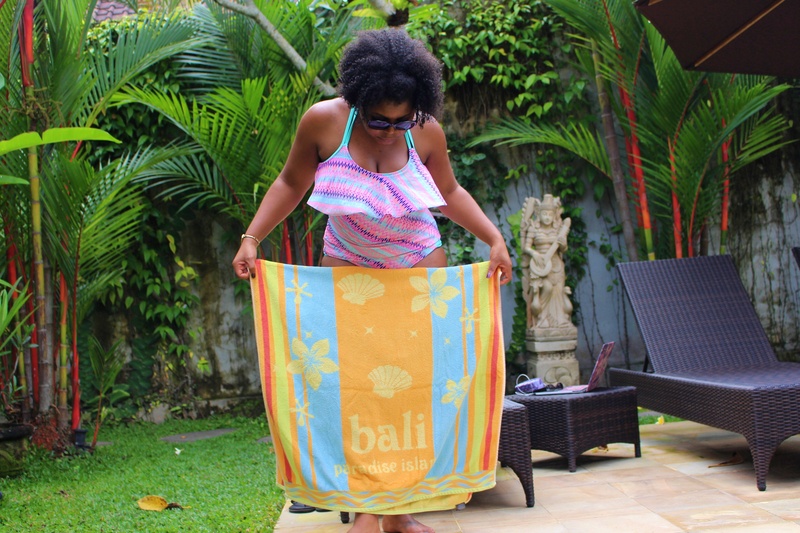 My mom and I traveled to Bali and stayed in Ubud 4 days. We had a two bedroom villa that had its own outdoor pool, kitchen, living room, and patio with an outdoor daybed. Let me tell you when I was met with the lizards and unknown noises in the bushes, I couldn’t have been further from my comfort zone. My mom jokingly asked what would I do if one day this moved or we came back to the villa and it was in a different spot. I told her I would hurt myself lol. After dinner, my mom decided she was going to turn on every light possible before bed and made it clear the lights would stay on allll night. She said she needed to see EVERYTHING even what might come out the bushes. Long story short a bug flew onto a sliding door and was determined to get to my bedroom light. My mom had left my doors cracked and the bug succeeded. What did I do you ask? “Scoot over and make room” is what I told my mom when I walked into her room and I am not embarrassed or have no shame at all…I slept well that night. We met an elephant name MoMo who took us on a ride through the hilltops of Bali. MoMo is 25 years old from Sumatra, a large Indonesian island. The elephants are brought from Sumatra and then trained for the walking tour. I did quite a bit of research before choosing a company because I wanted to be sure the elephants were not being abused. When I first started the elephant ride I didn’t even want to step on the elephant back to get on, I was so worried about hurting him. I was nervous because it was bumpier than I imagined and I kept thinking lawd’ don’t let us fall off the whole family is going to be mad. I am quick to sign up for something like I’m down for it and be looking crazy when it’s time… I had my mom get on first. As we climbed higher and went around corners I wanted to close my eyes and not look over the sides but I kept them open because I knew I didn’t want to miss this moment that I was blessed to have. It is one of those life experiences that you can’t transfer the feeling it into words. If you have never ridden an elephant before I say go for it!!! After the elephant ride, we went over to Pod, one of the most popular chocolate producing factories in Bali. Bali is a place known for having some of the best cacao beans. We went sample crazy and bought quite a bit of chocolate, lemongrass, ginger, coconut, honeycomb and fruit and nuts to name a few. I plan to get chocolate wasted in the near future. So let me tell y’all I had thought about going to the monkey sanctuary while in Bali, but after coming across some monkeys going to the beach, my mind changed real quick. I knew the rule of not making eye contact with a male but just my luck I did and his eyes said he was daring me to try and get past him. He was ready to flex on me and I told him not me, not today, not never, and made a quick u-turn. I managed to get some pics of him from a distance because I clearly got punked… it’s better than what could’ve happened. The monkey that punked me. On our way back home we stopped at Uluwatu Temple located right at the Indian Ocean and took a few pictures. We encountered monkeys here as well but I managed to secretly use other people as my barrier and distraction to the monkeys. Don’t judge me, they seemed to not be afraid of the monkeys so why not walk next to or behind them.